Adam Savage, the former co-host of MythBusters, has a new show, MythBusters Jr., featuring six young experts in engineering, welding, astrophysics and design. 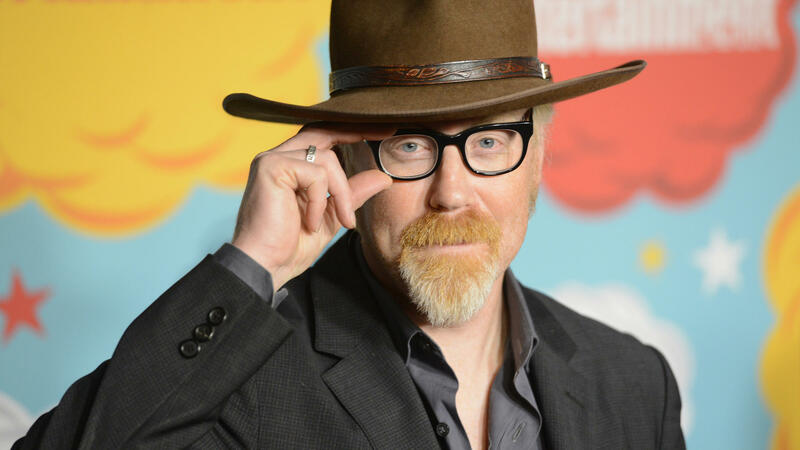 In his 14 years co-hosting MythBusters, Adam Savage performed experiments that fell squarely into the category of: Kids, do not try this at home! The Discovery show tested out the validity of myths, legends and movie scenes — whether that meant creating a flying guillotine, or escaping a car submerged in water. Now Savage is encouraging kids to join him in his experiments, in his new Science Channel show, MythBusters Jr. This time, he shares hosting duties with six youngsters who are experts in engineering, welding, astrophysics and design. And most of the experiments — like testing how many miles a pencil writes — are designed to be accessible. "Almost all the experiments we do during the season are more like 'do try this at home' experiments," Savage says. "Most of our small-scale experiments are something that almost anyone could do in their kitchen." It turns out, in the edit, it's so much more interesting to watch these kids build stuff than it is to watch me! I recognize on MythBusters my job was to be the audience's experiential avatar. That's what [co-host] Jamie [Hyneman] and I were there to do: Give you the exact feeling of what it might be like to fly in a U-2 or slide down this giant water slide. ... [In MythBusters Jr., I] was much more like the camp counselor and the ringleader and the advice-giver while these kids got to demonstrate and explore their competence. We were on a lake up in Gold Country, Northern California, and we had cleaned out the car of all of its fluids, so we didn't contaminate this lake, but we didn't realize in vacuuming out the 500 cigarette butts out of this disgusting car that vacuuming the cigarette butts only got rid of the physical manifestation of the smoking. It did not get rid of all the tar and nicotine embedded in the upholstery, which the moment the car filled with water turned the inside of the car milky white. When I opened my eyes after the car had fully submerged, they burned like I'd poured salsa in them. By the time I recovered from that weirdness, and I didn't even know what was happening at the time. I lost all my bearings about where I was in the car. This is a moment where I realized, "OK, I took a couple of breaths from this [oxygen] bottle I had on my shoulder, but that was only 30 seconds of air." I needed it to be a constant source. So I reached out for my safety diver, Don Best. He handed me an extra [air source] on his scuba rig. He's a licensed safety diver, and I took a deep breath from it, but the problem was I was upside down and Don was right side up and I had an upside down regulator in my mouth, which means I inhaled a ton of water. It is the most destabilizing thing to be holding my breath underwater, take what I think is a breath of air and breathe in a bunch of water. My whole body tensed up, and I remember being underwater and reminding myself that calm people live and tense people die. I forced myself to relax my muscles from my neck to my shoulders to my chest, my stomach, my legs, and then I thought, "What's your training? The training says pull out that regulator turn it upside down, pump it back in and purge it and it should be fine." And it was. But that's as close as I've ever come to panicking, and it's as close as I ever want to get. I think that I am a bit of a force of nature when I'm working in the shop. I am grabbing every tool at hand and I work as fast as I possibly can, which means I leave a trail of destruction behind me, which Jamie found super unpleasant and used to complain about a lot. I am extremely concerned, not just with what we're building but, with how it folds into the story. And Jamie was much more interested in the thing we were building. In essence, there are aspects of the storyteller I am that differed with the builder that Jamie is. At the same time, there were plenty of episodes in which Jamie contributed mightily to the wonderful narrative beats that became the final episode. On the saying on MythBusters that "failure is always an option"
It started out as a joke after a long day of, I think, waiting for biscuit dough to explode inside a hot car. ... It's actually one of the most scientific things you could say, because in the movies our culture thinks that scientists conduct experiments to confirm things. And really that's mostly not the case. Scientists conduct experiments to try and understand things. So there's no such thing as a failed experiment. Even an experiment that yields no data tells you not to conduct an experiment like that again. It, in and of itself, is data. So to me, again, promoting the idea that you don't have to get a specific result in order for the experiment to be successful is a really important one. I think it helps communicate that science is a messy and creative process, not a rigidly defined and uncreative process. Lauren Krenzel and Mooj Zadie produced and edited this interview for broadcast. Bridget Bentz, Molly Seavy-Nesper and Beth Novey adapted it for the Web. This is FRESH AIR. I'm Terry Gross. Can you survive an elevator plunging down in freefall if you jump right before it hits the ground? How hard is it to find a needle in a haystack? For over 14 years, our guest Adam Savage and his co-host Jamie Hyneman tried to find out the answers to questions like those on "Mythbusters." The popular and funny TV show used engineering and science to test out the validity of myths, urban legends and movie scenes. In doing so, they blew up a lot of stuff. Savage and Hyneman left the show in 2016, but Adam Savage is back with a new show called Mythbusters Jr. on the Science Channel. This time, he shares hosting duties with six incredibly smart teenagers. Before "Mythbusters," Adam Savage was a special effects designer and fabricator. He's worked at George Lucas' Industrial Light & Magic as a modelmaker for movies like "Star Wars: Attack Of The Clones" and "Galaxy Quest." Savage spoke with FRESH AIR producer Sam Briger. They started with a clip from the new show about the joys of duct tape. ADAM SAVAGE: In our second duct tape myth, the Mythbusters will be reinventing the wheel - sort of. ROBERT LEE: (As Narrator) To be specific, the myth is if you somehow end up with four flat tires, is it possible to make usable replacements out of our favorite sticky fabric? SAVAGE: I have used over 85 miles of duct tape over the years in busting myths about this stuff. But car tires never even occurred to me, and I don't know what the answer will be. I do know this. The kids will hate this smell just as much as I do. Ugh. Hello, old friend. LEE: ...To construct a trebuchet. SAM BRIGER, BYLINE: (Laughter) And that last big yeah is, I believe, my guest Adam Savage, and that's from the new show "MythBusters Jr." Adam Savage, welcome to FRESH AIR. SAVAGE: Thank you for having me. BRIGER: So are you really sure you used 85 miles of duct tape over your career? SAVAGE: Yeah. Actually, when we were wrapping up "MythBusters" in late 2015, we made a long calculation through all the duct tape episodes. And I believe the 85 miles is a pretty accurate number. BRIGER: In the original "MythBusters," you were like the energetic foil to your co-host Jamie Hyneman, who was more of a straight man. BRIGER: But, you know, on "MythBusters Jr.," you're still (laughter) the most enthusiastic person on the set. BRIGER: (Laughter) Like, I watched - I was watching the Jenga episode. Can you just explain briefly what the problem was in that? SAVAGE: The myth is that if you're in the late stage of a Jenga game, and the very bottom tile, Jenga tile, is a single tile - and again, this tower, it's late-stage game, so the tower is very teeter-y (ph) - that pulling out that bottom single tile is an impossible Jenga move. And we wanted to tackle and see if it really was impossible or if we could achieve it. BRIGER: Right. So these three kids came up with solutions to that. And they're about to test what they came up with, and they're all (laughter) excited but pretty calm. And every time they test one of their experiments, you're jumping around like a rodent just climbed up your pants (laughter). SAVAGE: (Laughter) I viewed my role with them on set as a permission slip to be absurd and to be excited. SAVAGE: So I would be riding my Onewheel or wearing costumes or holding on to foam swords all the time off set. SAVAGE: I really tried to create a slightly more absurd atmosphere to encourage them, to point out to them that this is how we're going to make good television. If we're having fun, we're going to make good shows. BRIGER: One of the things I really like about that Jenga episode is that one of the kid's experiments doesn't work well, and the entire tower of blocks collapses. And you yell out, you know, that was an utter failure. That was fantastic. BRIGER: And it echoes, like, this saying of "MythBusters" that failure is always an option. SAVAGE: It started out as a joke. It started out as a joke after a long day of, I think, waiting for biscuit dough to explode inside a hot car. SAVAGE: And then I realized after the editors made some real meat out of it in the edit that I thought, you know what? It's actually one of the most scientific things you can say because we're - you know, in the movies, our culture thinks that scientists conduct experiments to confirm things. And really, that's mostly not the case. Scientists conduct experiments to try and understand things. So there's no such thing as a failed experiment. Even an experiment that yields no data tells you not to conduct an experiment like that again. It in and of itself is data. So to me, again, promoting the idea that you don't have to get a specific result in order for the experiment to be successful is a really important one. It helps - I think it helps communicate that science is a messy and creative process, not a rigidly defined and uncreative process. BRIGER: I think it'd be great for the audience to hear a little bit more about some of the experiments that you're doing on "MythBusters Jr." Like, could you describe what the question was that you wanted to get out about Number Two pencils? SAVAGE: (Laughter) This grew out of a list I've been keeping since the beginning of "MythBusters" of just everything that I've ever thought that's a testable proposition. And there's an old "Dennis The Menace" comic strip where Dennis and a friend are on a sidewalk with a tube of toothpaste. And there's a line disappearing out of frame, and Dennis goes, there it is. I've proved that a whole block of toothpaste fits in this tube. SAVAGE: And I thought, well, that's a testable proposition. And I started to look around for stuff. And we found out that there is a myth that a single Number Two Ticonderoga pencil can draw a line that's 35 miles long or hold - or write 40,000 words. I believe those are the correct numbers. Forgive me if they're not exactly correct. There's a lot of data flowing around in this head. And then there is the question of how to test that proposition. How do you make a pencil write for 35 miles? How do you write 40,000 words? Is there a way we can automate this process? And that was where the junior - the "MythBusters" juniors really really shined in coming up with radically different ideas for testing these propositions. BRIGER: And then sometimes you learn that the only way to test a proposition is to do it with a lot of sweat and hard labor and maybe write out those 40,000 words. SAVAGE: Yeah. So we looked at machines for writing signatures for politicians. And they do exist, but they don't exist to do what we needed, which was just to write thousands and thousands and thousands of words. So yes, the way we tested the 40,000-word proposition was we had a pencil and a notebook and every single person on the crew was responsible for writing out, I think, 2,000 words. And we just slowly burned through that book over the course of shooting that episode. GROSS: We're listening to the interview FRESH AIR producer Sam Briger recorded with Adam Savage, host of "MythBusters Jr.," which can be found on Science Channel On Demand, sciencechannel.com and on the SCI GO phone app. We'll hear more of their interview after a break. This is FRESH AIR. GROSS: This is FRESH AIR. Let's get back to the interview FRESH AIR producer Sam Briger recorded with Adam Savage, former co-host of "MythBusters" and now the host of the Science Channel spinoff series "Mythbusters Jr." He works with six really smart teenagers carrying out experiments using engineering and science to test out the validity of myths, urban legends and movie scenes. Some of these tests can be dangerous. BRIGER: ...Not working. And so you lower the weight. I'm not going to say what it is, and then you try to fix through the problem. So here we go. SAVAGE: We had a failure of the rig in midair, which was pretty scary because this weighs several thousand pounds and so does that. We isolated the problem to an air leak which no longer exists. And we should be able to drop a car soon. BRIGER: (Laughter) So you're - there's all this very serious technical jargon. And basically, you're dropping a large amount of weight upon a car. SAVAGE: And those situations are among the most scary because out there on site, we've got a rig that's difficult to unset, right? We've hung this weight from a crane. It's got to be stable. The crew is sitting there. We're in the middle of a town. You know, like, there's not a lot of options. And that is where the incredible amount of institutional knowledge I have from "MythBusters" and the countless times Jamie and I were confronted with a similar situation (laughter) - it requires me to slowly approach the extremely dangerous thing in the safest way I know how and figure out how to make it safe. BRIGER: Out of all the years that you've done "MythBusters," what was the time that you felt most in danger or afraid for your safety? SAVAGE: An episode that my mom is still not allowed to watch, "Underwater Car." BRIGER: Oh, yeah. Yeah, that's a great episode. SAVAGE: Yeah. And we did two underwater car episodes. We did one back in '07 where I sank in a car that we lowered into a swimming pool. But then it turned out that most cars when they ditch into the water turn upside down. Like, they go off a bridge. They hit the water with their trunk, and their heavy front-weighted weight distribution causes them to turn turtle. And so we designed a methodology to achieve that. And then we got a car. We were on a lake up in Gold Country, Northern Calif. And we had cleaned out the car of all of its fluids so we didn't contaminate this lake. But we didn't realize in vacuuming out the 500 cigarette butts out of this disgusting car - that vacuuming the cigarette butts only got rid of the physical manifestation of the smoking. It did not get rid of all the tar and nicotine embedded in the upholstery which, the moment the car filled with water, turned the inside of the car milky white. And when I opened my eyes after the car had fully submerged, they burned like I'd poured salsa in them. And by the time I recovered from that weirdness - and I didn't even know what was happening at the time - I lost all my bearings about where I was in the car. And this is a moment where I realized - OK, I took a couple of breaths from this pony bottle I had on my shoulder, but that was only 30 seconds of air. I needed a constant source. So I reached out for my safety diver Don Best (ph). He handed me an extra octopus on his scuba rig. He's a licensed safety diver. And I took a deep breath from it. But the problem was I was upside down, and Don was right side up. And I had an upside down regulator in my mouth, which means I inhaled a ton of water. And it is the most destabilizing thing to be holding my breath underwater, take what I think is a breath of air and breathe in a bunch of water. And I got - my whole body tensed up. And I remember being underwater and reminding myself that calm people live and tense people die. And I forced myself to relax my muscles from my neck to my shoulders to my chest, my stomach, my legs. And then I thought, what's your training? The training says pull out that regulator, turn it upside down, pop it back in and purge it. And it should be fine, and it was. But that's as close as I've ever come to panicking. And it's as close as I ever want to get. BRIGER: Well, I was talking to some people about that episode. And they were like, oh, that's my biggest fear; you know, I'm really worried about getting stuck underwater in a car. And you've said that one of the important things to do is to try to remain calm. But what else did you learn about that? SAVAGE: ...Different people writing us after having seen the episode and having ditched into the water in their car and using what we learned on the episode to get to safety. And one of the key things is that as your car is filling up with water - and it doesn't happen instantaneously. It takes about a minute for your average sedan to fill up with water to start sinking. As your car is filling with water, there's a pressure differential between the inside and the outside in which the water is rushing into the car. And it means - that pressure differential means that you won't be able to easily open one of the doors while the car is sinking. And so what you need to do is you need to actually wait until the car is mostly filled with water, which means, again, you're going to have to - in our experience, you have to wait until the water's at your neck, hyperventilate a little bit to oxygenate your blood and then hold your breath until the car is completely full of water. And then opening the door should be fairly trivial. BRIGER: ...Trucks, shooting rocket sleds at them. So just where did you get all these cars? Did you, like, buy them on classifieds, or did you go to a lot or something? Like, where do they come from? SAVAGE: Well, it depended on whether they needed to be running or not. If they didn't need to be running, we usually got them from a metal recycler or a Pick-n-Pull lot. If they needed to be running, it was often Craigslist. I will tell you there was almost no car we destroyed that we didn't get a piece of angry mail from some avid collector of that kind of car. SAVAGE: That was a guarantee, especially when we did the - we did an ejection seat episode trying to replicate James Bond's ejection seat. And we needed a car - it turns out that most car roofs are way pitched in from the outside of the car. We needed a car that was much more boxy and upright. And we couldn't afford a BMW 2002, so we went with a Toyota Corona, a lesser-known early '70s Toyota. And, boy, the Toyota Corona users group really had their way with us. SAVAGE: They were very mad about us destroying that thing. BRIGER: There were a lot of episodes in the past where you shoot firearms. Like, you see whether a Bible or a similar sized book could prevent you from getting hit by a bullet and other things like that - like a flask. You know, there's been so many shootings over the last few years. Do you reconsider making those episodes? SAVAGE: Yes, I grapple with that. Both Jamie and I have the same feeling about guns, which is that they are both remarkable and terrible machines. And putting bullets in one and getting ready to shoot it is, as far as I'm concerned, a horrifying responsibility. We really worked extremely hard to construct our episodes so that we were demonstrating proper handling techniques and experimental techniques that were robust and extremely safe, also to cover the fact that they were scary. And, yeah, I think that the gun culture in the U.S. is problematic. And I support reasonable controls and reasonable laws allowing us to regulate them. I don't think they should all go away. But I also don't think that anyone who wants one should have one. We have to strike a balance to that, and I get a lot of people who tell me I contributed to the United States' gun culture. And if that's the case, that's something that I have to take responsibility for. But I really hope that we showed that human ingenuity that develops these things - these tools that can, in some cases, be used for good rather than for ill - if they're used safely and soberly, you know, that's the kind of thing I want to contribute to the culture. BRIGER: And then he would laugh a lot. And you were always the enthusiastic, laughing, a little goofy foil to him. And rather than ask you sort of what bugged you about him, I was wondering if you could think about what it was about you that got under his skin. SAVAGE: ...So I can build things? Jamie didn't like having cameras pointed in his face. So in essence, I think that there are aspects of the storyteller that I am that differed with the builder that Jamie is. And at the same time, there were plenty of episodes in which Jamie contributed mightily to the wonderful narrative beats that became the final episode. Let's see. What else about me drove Jamie crazy? He would often make a joke about how much I was one hot mic away from losing everything because I would tell these terrible jokes to my crew while warming up on camera. Maybe I shouldn't say that publicly. GROSS: We're listening to the interview FRESH AIR producer Sam Briger recorded with Adam Savage, the host of the Science Channel's "Mythbusters Jr." We'll hear more of their interview after a break. This is FRESH AIR. GROSS: This is FRESH AIR. Let's get back to the interview FRESH AIR producer Sam Briger recorded with Adam Savage, the former co-host of "MythBusters" and now the host of the Science Channel's spinoff series "MythBusters Jr."
BRIGER: You worked on "MythBusters," the original show, for 14 years. How do you think you changed over the years working on that show? SAVAGE: That show so fundamentally changed me in every way - as a person, as an engineer, as a scientist. When I started making "MythBusters," like I said, we weren't planning to make a science show. And I specifically, even though I was a science geek - I subscribed to science magazines, and I kept apprised of interesting things going on in science - I still thought of science is something that smart people did. And in doing that, I placed myself outside that category. And over the course of doing this show, I realized that I am a scientist, that I am an engineer and that my explorations and the conclusions I can come to by building rigid, rigorous methodologies to test my hypotheses can yield real results that I can stand by. And I learned to love that process like a scientist does. BRIGER: I think you've made it clear over the years how important "Star Wars" was to you growing up. And what's amazing to me is that as an adult, you got to work at Industrial Light & Magic and build models for the newer "Star Wars" films. I mean, that must have just blown your mind. SAVAGE: It's hard to overestimate how shocked I still am that it happened. You know, my - the first job I ever knew I wanted was to be a LEGO designer. And that was almost immediately supplanted by wanting to work on "Star Wars" when it came out when I was 10 years old. And then in 1998, when I finally got up to San Rafael to work on episode one, and I was working with heroes that I'd been reading about since I was 10 - Steve Gawley, Lorne Peterson, Richard Miller, Charlie Bailey, these wonderful guys who are now friends of mine and who were so generous with their knowledge - and that was - it wasn't just amazing to work on "Star Wars," even though that was really enjoyable. What I really loved about the model shop was that camaraderie of problem solving, the generous sharing of information and ideas and collaboration inherent in the whole process of executing special effects. That's - that was the unexpected incredible bonus that I did not see coming. BRIGER: Your dad was an artist, but it sounds like he made his living creating animated short films for "Sesame Street." Is that right? BRIGER: And it sounds like he was a really big influence on you becoming a maker. SAVAGE: Well, both my parents were incredibly encouraging of my explorations. They valued the things that I couldn't stop thinking about, and they let me know that that had a value. BRIGER: And your dad also would build things in your garage, and you would build those things together, right? SAVAGE: Oh, yeah. My dad was a - my dad was an inveterate tinkerer. He grew up on a farm in Texas and in Charleston, W.Va. And, you know, he built a deck on the back of our house three different times, (laughter) never to code, but always each one was better than the last. So I definitely grew up in an environment where you could modify your environment, and you could take things apart and put them back together and make them better. BRIGER: You've also said that he had bipolar disorder, which made your home unpredictable. You called him a difficult, amazing, terrifying, creative and stultifying force. Was he diagnosed at the time? SAVAGE: Yeah, absolutely. And all of that is true. It was a - you know, we all have to recover from our childhoods, and I had to recover from that. BRIGER: How did you try to make sense of that as a kid? Like, did you understand it as mental illness, or you just had to deal with erratic behavior in the household? SAVAGE: (Laughter) I mean, as a kid, you come to all these conclusions that aren't necessarily right, but they help you survive in the moment. And then you spend, as far as I can tell, the rest of your life unpacking those poor coping mechanisms to see where they do and they don't serve you. The unpredictability of my house was difficult and complicated. It was also a house very full of love and support at the same time as it was that complicated. You know, I don't think I suffered any more or less than anybody else did. It's just that was the unique thing that I had to deal with growing up. BRIGER: Well, Adam Savage thanks so much for being on the show. SAVAGE: Thank you for having me. This was really, really fun. GROSS: Adam Savage spoke with FRESH AIR producer Sam Briger. Savage hosts "MythBusters Jr." The series can be found on Science Channel On Demand, sciencechannel.com and on the SCI GO phone app. Tomorrow on FRESH AIR, we'll talk about how the brain responds and adapts to certain drugs and alcohol leading to addiction. My guest will be Judith Grisel, author of "Never Enough: The Neuroscience And Experience Of Addiction." She is a neuroscientist who studies addiction, and she's a recovering addict who's been sober for 30 years. I hope you'll join us. GROSS: FRESH AIR's executive producer is Danny Miller. Our technical director and engineer is Audrey Bentham. Our associate producer of digital media is Molly Seavy-Nesper. Roberta Shorrock directs the show. I'm Terry Gross.